Here is another of my former family. This little lad had a short life unfortunately, and died before his 4th birthday. A problem in his bones and his backend and hips became very unstable, he constantly walked with a shake. Apparently other dogs from the litter also died young. But whilst he was here, he enjoyed what looks like a leisurely life in the Jungle Room. heh! heh! 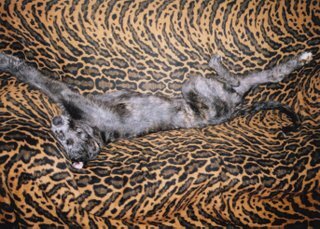 Here he is sound asleep on the settee throw. I don’t get any throw when I sneak onto the settee. The origin of the name Tynam, lies in the Gaelic for the ‘Dark’ or ‘Dusty’ one . . . so now you know. Today on my home territory country ramble, I stumbled accross the body of a poor badger laying in the undergrowth. Hopefully it was not killed or poisoned, but perhaps died of natural causes. These little creatures are becoming rarer than us deerhounds. 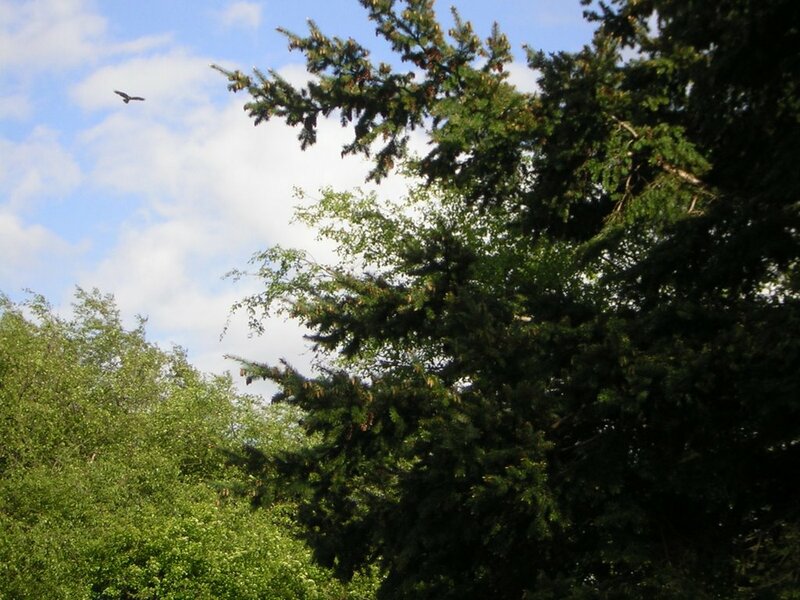 On a positive note tho’, in the sky above flew a buzzard. It’s good to see these birds of prey on the wing - no doubt, after the carrion. Unbeknown to most, the woodland where I, and almost no-one else walks on a daily basis is the former Castle Wood. Known so, because underneath all the overgrown mounds of earth, trees and shrubbery, the ruins of an old castle keep lie burried. This was where Mary Queen of Scots (the beautiful Queen, so envied by Queen Elizabeth I, the virgin queen of England) used to change her horses, when she rode from her palace home at Linlithgow to affairs of state and I believe romance in Edinburgh. A great keeper of deerhounds - I’m sure some of my ancestors would run along through here, with them possibly having enjoyed a Forth Valley hunt or ‘trae’. I think the ‘time team’ should perhaps be encouraged to come along and possibly get their archaeological paws dirty at this historical site. 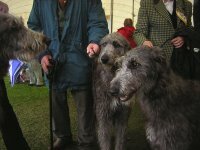 Although I was not showing my humans at The Scottish Kennel Club show, they did go along with a video camera and capture a little footage. Here’s the result! If you had been in attendance it wouldnae be a surprise to find yourself 'drookit' as the rain poured frae the sky all morning and the ground was sodden. 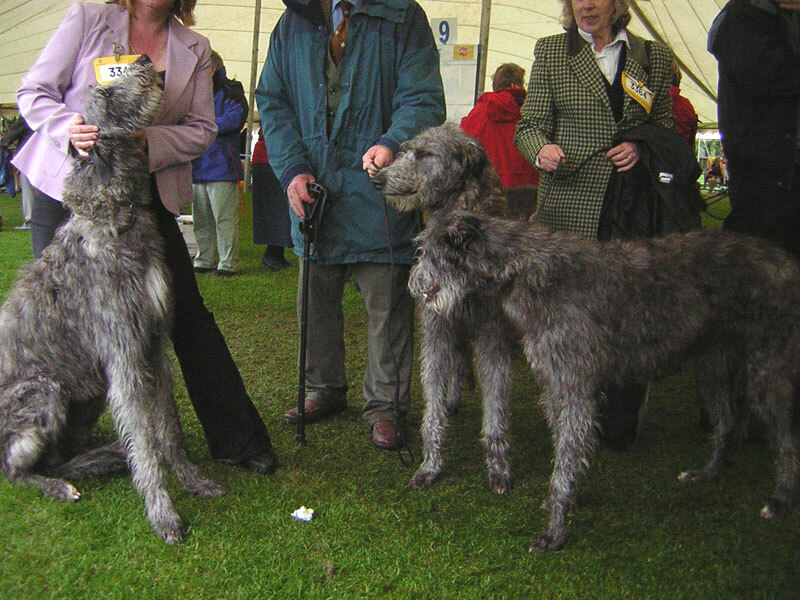 Luckily the marquees kept the rain from the show rings, but we Scottish Deerhounds are used to the wind and rains, sleet and snow and misty mountain conditions that shape the Scottish Hardiness. If your human hunts well enough, they might just find little desirable works of art. 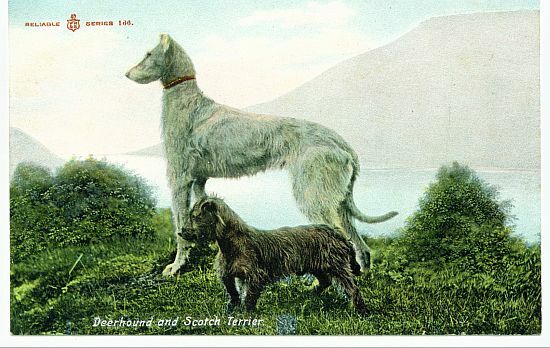 This little postcard features the ever so popular choice of hound for portraiture from the early 20th century . . . the Scottish Deerhound of course! Today I have decided to put some family pics up on my blog. 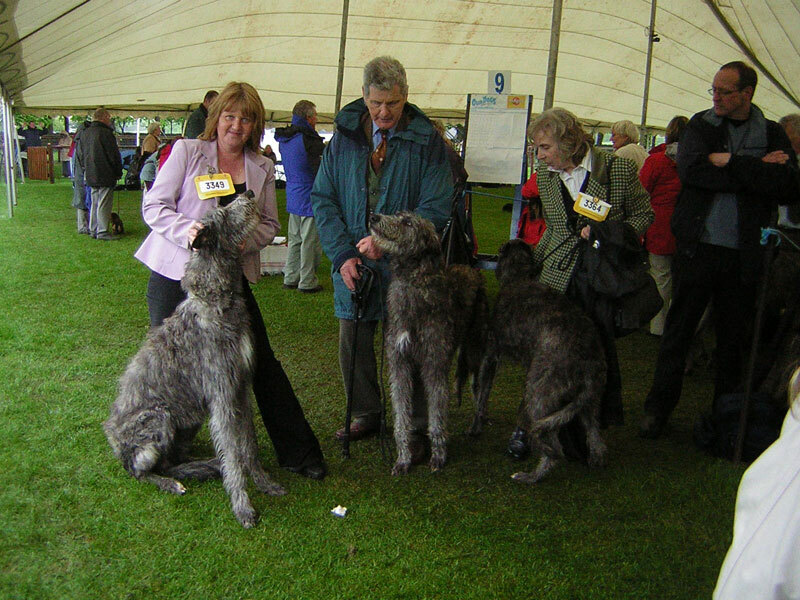 Taken yesterday at the Scottish Kennel Club Championship show, here are two of my brothers and a sister. I believe 'Hamish', that’s him in the middle, decided to give the Judge a good Highland welcome and leapt up all over him. I’m not the only ‘Rogue’ in the family it would appear. It’s interesting to be a dog at these events watching the humans judge each other parading us deerhounds around. Some say they judge by the names of the humans, some say they judge by how well they know each other. It’s quite fun really, but for them humans . . . it’s oh so series at times. I must take my human companions along for judging. Now I wonder what they’ll make of a 10 year old girl? Today is the Scottish Kennel Club show at Ingliston Show Ground, in West Lothian, with Deerhounds in the ring at 9.30am. 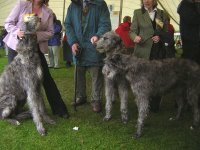 The Vet has told me to rest for another week, so whilst I have my paws up, here is another video featuring Scottish Deerhounds at the recent Hound Association of Scotland Championship Show also held at Ingliston, recorded on Saturday, April the 8th, this year. 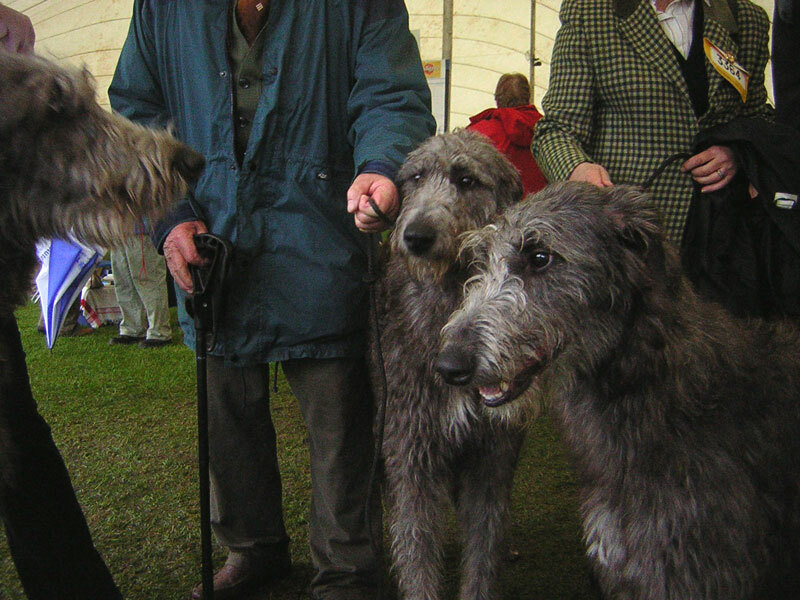 You’ll see many celebrity Scottish Deerhounds and their honoured kennel cleaners showing them. Running around the show ring is fun . . . but hey! 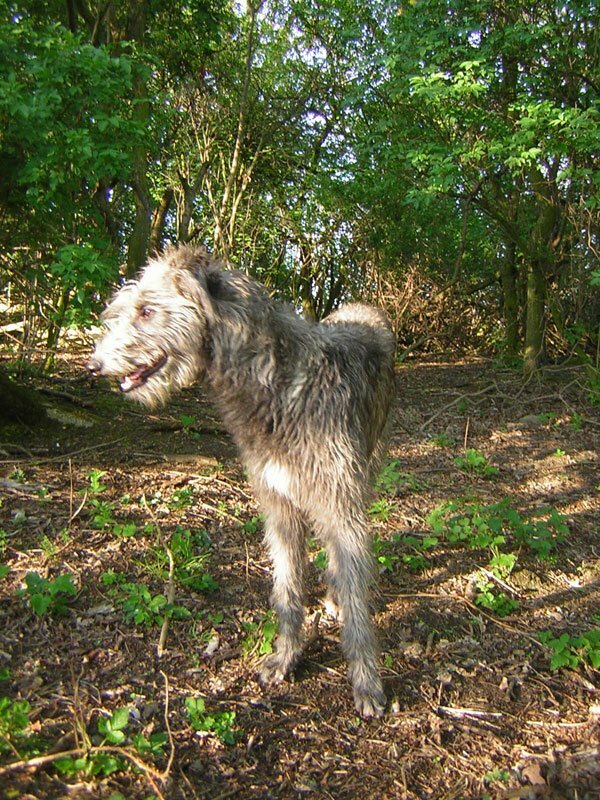 we know where the real Deerhound comes into his own . . . High in the Misty Highlands! As a dog I’m not interested in advertising revenue, so I only keep this Blog out of love. As long as I have a comfortable bed, good food to eat, fresh water to drink, plenty of space to run and I feel safe within my clan, I’m happy. 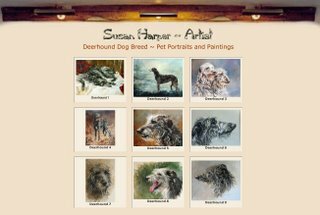 But here is a little website that features portrait art of us deerhounds and the artist takes commision if you want your dog portrait painted - contact susan here http://www.susanharperartist.com/animals/dogs/deerhound/ and tell them Rogue sent you. I return to the Vet this evening, to hear how my shoulder joint is fairing up. 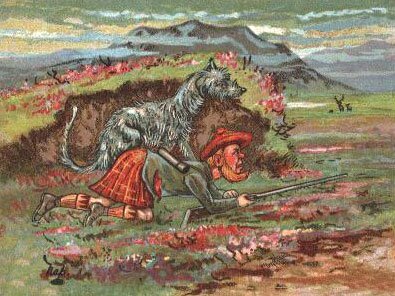 So in a positive, look forward, kind of a mood, I thought I would post up this little humorous stab at us Scottish Deerstalkers, from a postcard printed back in the day. When I get the all clear . . . I’ll teach the artist of this card how to run! Arf! Arf! This weekend I visited the Vet because I have had pain in my right shoulder joint. I guess I shouldn’t have been proving to the world that I’m the fastest running dog in the whole universe. 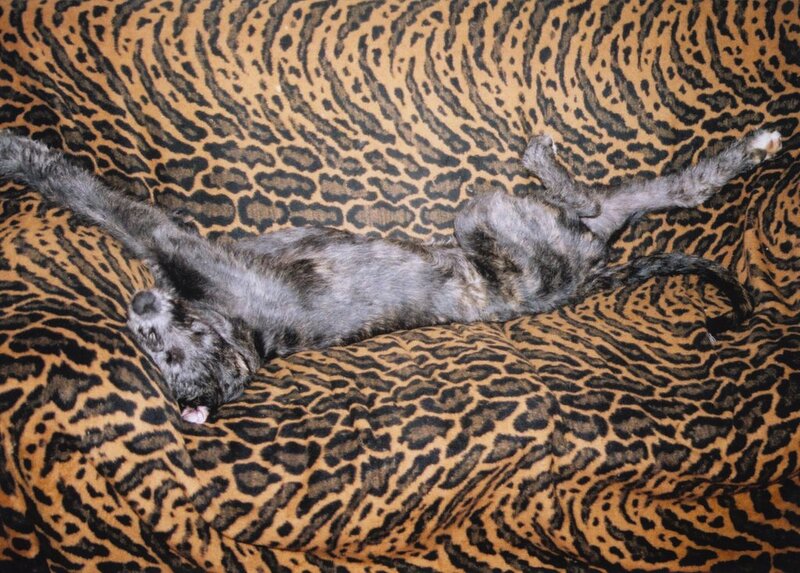 Now I have to rest for a week, take a course of Metacalm and only use the garden for exercise. 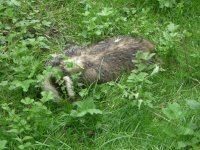 Still, I have managed to destroy all the bedding plants and will probably do so until my return to the Vet this Friday. I'll miss the Scottish Kennel Club Championship show this weekend, but can’t wait to see the forthcoming pics and video. Oh and all you deerhound fans should visit my friends, why not drop in on Angus and Isla at http://beaky-blog.blogspot.com/ and Hjorthunden Jackie at http://deerhound.blogspot.com/ I’m sure they would be glad to hear from you. Here are another couple of comparative pieces of hunt art for the discerning Hound Historian. As you can see them ‘damned highland ruffians, don’ty know how to conduct a hunt!’ but as a deerhound, it looks to me that the auld deerhound and kilties certainly know how to put a tasty meal on the table. 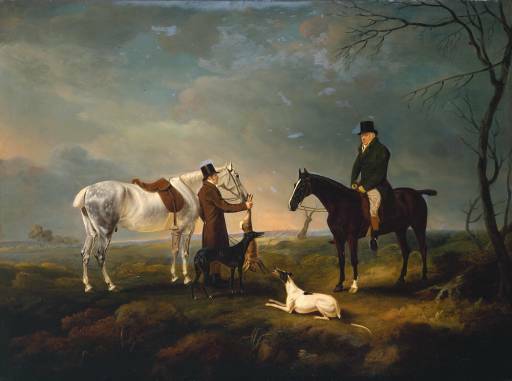 Mind you those Southerly Lords and their greyhounds could bake a tasty pie with that game bag of theirs. But as a deerhound my heart is in the Highlands any day! 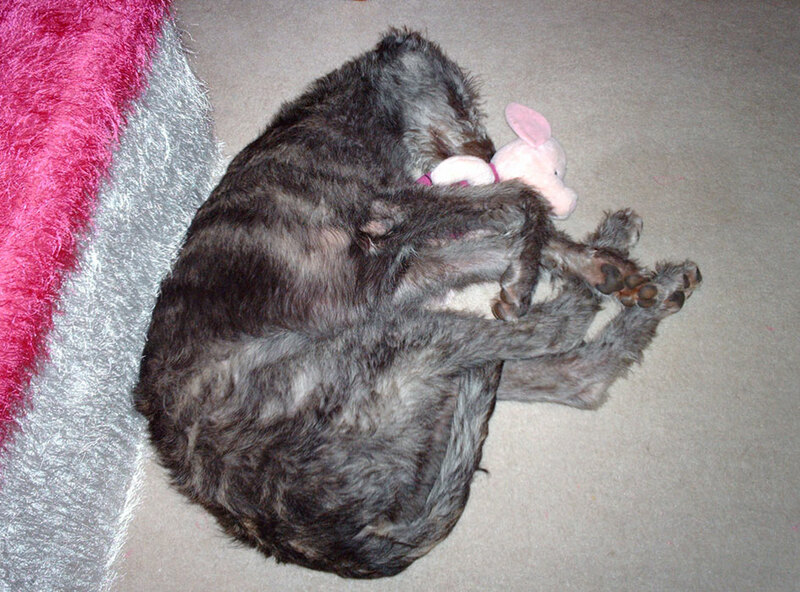 We Deerhounds should remain dignified and proud at all times, but when you’re a baby and fall asleep with the Piglet toy and them humans sneak up on you with the camera . . . one ends up with the embarrasing puppy picture that I hope no future Girlfriends have the opportunity to see. 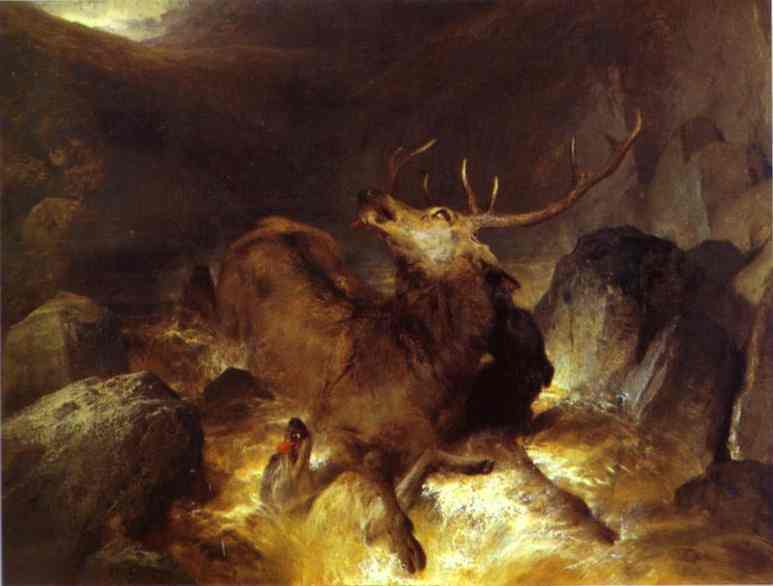 Up the stream we’ve found the Stag! Un-popular as it might be with some . . . those who believe meat comes out of the factory in little polystyrene trays, or cooked into a microwave readymeal dish . . . hunting is what Scottish Deerhounds were born to do . 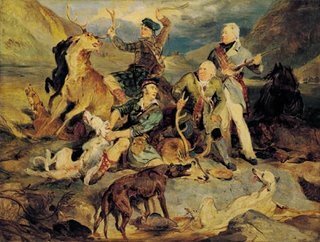 . . so here is another little watercolour potraying the excitement of the hunt enjoyed by us hounds.
. . . game, is game. So when I was out crossing the glen the other day and I came accross these ducks in a flooded field, I thought I would try and catch them. I know Uncanny and Woody the former hounds o the house had a few adventures with flying species. 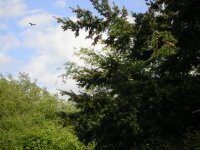 When Woody startled some rabbits and set off in pursuit, a partridge took flight from the field edge and Uncanny, bringing up the rear, thought it was a flying Rabbit, turned instinctively and snatched it from flight. Unfortunately on my Duck hunt adventure they were just out of range and I was hampered by the water. Being the romantic auld soul that he was, Sir Edwin Landseer has to be the number 1 artist of Deerhound works. An auld garden kennels worth o paintings must have been produced. 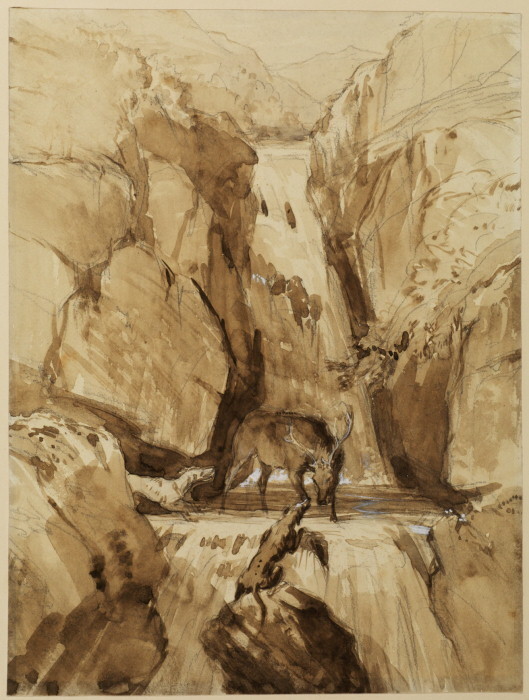 To view and appreciate them for real, the tait gallery in Londinium is a guid place to start. Here’s possibly the most action packed of the hunting paintings and I would suggest a guid towel down would have been the order o’ the day after this. 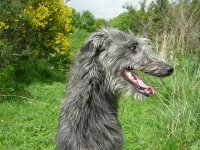 Being a dog it’s quite difficult to find time to read books, but here’s another author who was a keeper of otters and owned a deerhound named Dirk. Gavin Maxwell author of ‘Ring of Brightwater’, lived on the rugged West of Scotland Coastline. 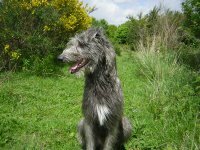 What better a hound to keep at home, than one who would make every effort to get on with otters but a Scottish Deerhound of course. 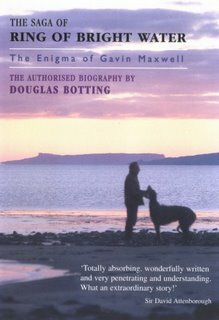 Check out this book for the lifestory of the enigmatic Gavin Maxwell.